Juan Mascaró was born in Majorca. The beauty of the island, then un spoilt, and the strength of the living folk tradition, made a deep impression on him as a child. At the age of thirteen he copied a book on occultism, but this proved spiritually, misleading. However, he found a reading of the Bhagavad Gita highly illuminating, although it was in a poor translation, and this led him to study the elements of Sanskrit. Later he went to Cambridge, where he read modern and oriental languages, Sanskrit, Pali and English. The first translation from Sanskrit Into English was a translation of the Bhagavad Gita. It was done by Charles Wilkins in 1785. Later on, when Alexander Hamilton, 1765-1824, was returning from India in I802 and was obliged to stay in Paris because of the war, he taught Sanskrit to Friedrich von Schlegel, 1772-1829, the great German critic, who with romantic enthusiasm spread the knowledge of Sanskrit in Germany and his brother August translated the Bhagavad Gita into Latin. The study of Sanskrit led to the comparative study of languages. It was found that Sanskrit, Persian, Greek and Latin, and also the Celtic, Germanic and Slavonic languages come from a primitive unwritten language called Aryan. From Ireland to India, and all over Europe and America, Aryan languages are spoken. For over 3,000 years there has been an uninterrupted Sanskrit culture in India, if we include the Sanskrit of the Vedas, and Pańini produced about 300 B.C . a perfect Sanskrit grammar, 'the shortest and fullest grammar in the world'. Sanskrit literature is a great literature. We have the great songs of the Vedas, the splendour of the Upanishads, the glory of the Bhagavad Gita, the vastness of the Mahabharata, the tenderness and heroism found in the Ramayana, the wisdom of the fables and stories of India, the scientific philosophy of the Sankhya, the psychological philosophy of Yoga, the poetical philosophy of Vedanta, the laws of Manu, the grammar of Panini and other scientific writings, the lyrical poetry and drama culminating in the great poetry and dramas of Kalidasa. found in Sanskrit There is no history and there is no tragedy: there is no Herodotus or Thucydides; and there is no Aeschylus or Sophocles or Euripides. Greece and India give us complementary views of the world. In the Greek temple we find the clear perfection of beauty: in the Indian temple we find the sublime sense of Infinity. Greece gives us the joy of eternal beauty in the outer world; and India gives us the joy of the Infinite in the inner world. Thou, silent form, dost tease us out of thought As doth eternity. Cold Pastoral ! These words of glory to the God who is light shall be words supreme amongst things that are great. I glorify Varuna almighty, the God who is loving towards him who adores. We praise thee with our thoughts, O God. We praise thee even as the sun praises thee in the morning: may we find joy in being thy servants. Keep us under thy protection. Forgive our sins and give us thy love. thee, O King. Cut off the bonds of afflictions that bind me: I cannot even open mine eyes without thy help. Let the dread weapons that wound the sinner hurt us not. Let us not go from light into darkness. We will sing thy praises, O God almighty. We will now and evermore sing thy praises, even as they were sung of old. For thy laws are immutable, O God: they are firm like the mountains. Forgive the trespasses that I may have committed. Many mornings remain to dawn upon us: lead us through them all, O God. He placed apart the heaven and the earth. He set in motion the sun and the stars and spread our earth before them. His greatness gave wisdom to the children of men. And I speak with mine own heart and I ask: How shall I have communion with my God ? What offerings of mine will he accept without anger? When shall I with a glad heart find his mercy? I ask others for I would fain know my sin: I seek the wise and I ask them And one answer the sages give me: God, Varuna, is angry with thee. What hath been, O my God, my transgression? Why wouldst thou slay thy friend who sings praises to thee? Tell me, all-powerful God, that pure from sin may I hasten to thee in adoration. Loose from us the sins of our fathers. Forgive us our own sins, O Lord. It was not my will, it was an illusion. It was thoughtlessness or anger or wine. The stronger is near to lead astray the weaker: even sleep can lead men to sin. May I serve my God, the all-merciful. May I serve my jealous God free from sin. Our God gives wisdom to the simple; and leadeth the wise unto the path of good. May this song of praise come to thee, O Varuna: may this song of praise abide in thine heart. May it be well with our rest and our labour. May thy blessings be with us for evermore. There was not then what is nor what is not There was no sky, and no heaven beyond the sky. What power was there ? Where ? Who was that power? Was there an abyss of fathomless waters? Who knows in truth? Who can tell us whence and how arose this universe? The gods are later than its beginning: who knows therefore whence comes this creation ? In the last verse of this poem we have the beginning of philosophical inquiry: the poet of the Vedas saw that for the progress of the mind man requires doubt and faith. In the Vedas we have the dawn of spiritual insight. In the Upanishads we have the full splendour of an inner vision. About 112 Upanishads have been printed in Sanskrit but the most important ones are about eighteen. 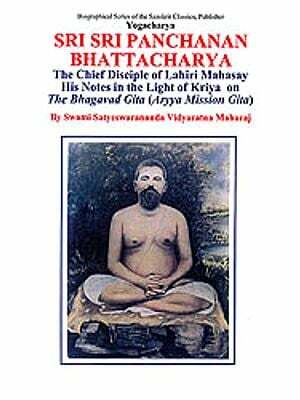 The two longest, the Brihad-Aranyaka and the Chandogya, cover about I00 pages each. The length of most of the others ranges from about three to thirty pages, and a few are longer. The Isa Upanishad, one of the most important has only eighteen verses. The earliest parts of the Upanishads are in prose and they may date from about 70ò b.c. The verse Upanishads are generally much later. We know practically nothing of their authors: they seem to come from the Unknown. From nature outside in the Vedas, man goes in the Upanishads into his own inner nature; and from the many he goes to the one. We find in the Upanishads the great questions of man, and their answer is summed up in two words: brahman and atman. They are two names for one Truth; and the two are One and the same. The Truth of the Universe is brahman: our own inner Truth is atman. The sacred om is a name for both Brahman and Atman. This can be divided into three sounds, but the three roll into one: auM. One of the meanings of om is yes. Brahman, Atman, om, is the positive Truth, the Yes, of all. Around this central idea we have all the questions and answers, the stories, the great thoughts and, above all, the wonderful poetry of the Upanishads. Who sends the mind to wander afar ? Who first drives life to start on its journey ? Who impels us to utter these words ? What cannot be spoken with words, but that whereby words are spoken. Know that alone to be Brahman, the Spirit; and not what people here adore. What cannot be thought with the mind, but that whereby the mind can think. Know that alone to be Brahman, the Spirit; and not what people here adore. He is seen in nature in the wonder of a flash of lightning. He comes to the soul in the wonder of a flash of vision. om. The eternal Word is all: what was, what is, and what shall be, and what beyond is in eternity. All is om. The third condition is the sleeping life of silent consciousness when a person has no desires and beholds no dreams. inner consciousness, neither semi-consciousness nor sleeping consciousness, neither mere consciousness nor unconsciousness. He is Atman, the Spirit Himself, that cannot be seen or touched, that is above all distinctions, beyond thought and ineffable. In the union with Him is the supreme proof of His reality. He is peace and love. This above all, - to thine own self be true; And it must follow, as the night the day, Thou canst not then be false to any man. The essence of the Upanishads is summed up in the words 'tat tvam asi', 'That thou art'. Salvation is communion with Truth: Satyam eva jayate, says the Mundaka Upanishad, 'Truth is victory', to find truth is to conquer. The joy of the infinite is ever with us, but we do not know this truth. We are like the beggar in the story who had been begging all his life in the same place. He wanted to be rich, but he was poor. When he died they found a treasure of gold buried just under the place where he had been begging. If he had only known how easy it was to be rich! True knowledge of the Self does not lead to salvation: it is salvation. But this is not an intellectual knowledge or even a poetical vision: 'In the union with Him is the supreme proof of His reality'. We may read in the Upanishads that beyond our becoming there is our Being, that beyond suffering and sorrow there is Joy, that beyond the three stages of ordinary consciousness there is a fourth state of supreme Consciousness; but what we read are only words. We cannot know the taste of a fruit or of a wine by reading words about them: we must eat the fruit and drink the wine. The seers of the Upanishads did not establish a Church, or found a definite religion, but the seers of the Spirit in all religions agree that communion with the Highest is not a problem of words but of life. Behold the Universe in the glory of God: and all that lives and moves on earth. Leaving the transient, find joy in the Eternal: set not your heart on another's possession. The Spirit, without moving, is swifter than the mind; the senses cannot reach Him: He is ever beyond them Standing still, He overtakes those who run. To the ocean of His being the spirit of life leads the streams of action. O life-giving sun, offspring of the Lord of creation, solitary seer of heaven I Spread thy light and withdraw thy blinding splendour that I may behold thy radiant form: that Spirit far away within thee is my own inmost Spirit. May life go to immortal life, and the body go to ashes. om. O my soul, remember past strivings, remember ! O my soul, remember past strivings, remember ! By the path of good lead us to final bliss, O fire divine, thou god who knowest all ways. Deliver us from wandering evil. Prayers and adoration we offer unto thee. Wherewith shall i come before the Lord, and bow myself before the high God? shall i come before him' with burnt offerings, with calves of a year old ? Will the Lord be pleased with thousands of rams, or with ten thousands of rivers of oil ? shall i give my first-born for my transgression, the fruit of my body for the sin of my soul ? He hath shewed thee, O man, what is good; and what doth the Lord require of thee, but to do justly, and to love mercy, and to walk humbly with thy God ? Micah did not give us the metaphysics of an inner sacrifice as the Upanishads do. They give us our inner i am who is ours and not ours, because it is the I am of all, the i am of the universe. According to Coleridge, the higher Imagination is 'the repetition in the finite mind of the eternal act of creation in the infinite I am'. This idea might lead to the Upanishads: the Infinite is ever in us and the finite in us can have communion with the Infinite. There are three different paths to reach the Highest: the path of I. the path of Thou, and the path of Thou and I. According to the first, all that is, was, or ever shall be is I, my higher Self. In other words, I am, I was, and I shall be for ever in Eternity. According to the second. Thou art, O Lord, and all is Thine. And according to the third. Thou art the Lord, and I am Thy servant, or Thy son. The first way is the way of the Upanishads and of the Vedanta; the second way is the way of love, of Mary in the Gospels; the third way is the way of service, of Martha. The three ways have in common that what is important is something above our little self, whether we call this I am , or 'Thou art', or whether we say, "Thou art my Master'. In the three ways there is an absolute forgetfulness of our lower personality, and a recognition of a higher Personality. The Brahman of the Upanishads is, however, beyond all conception : it includes all, but it is beyond all. To become one with Brahman means a process of deep thought, before we can transcend thought. Love and work are easier ways. The Vedas laid stress on the outer world, the world of action of the Immanent; and the Upanishads laid stress on the inner world, the world of knowledge of the Transcendent Spirit. In the Isa Upanishad we find the word Isa, God, and not the word Brahman, although the spirit of Brahman breathes through the Upanishad. We also find a harmony of action and knowledge, of the immanent and the transcendent. All action, including religious ritual, can be a means of reaching the inner meaning of things. This vision of action with a consciousness of its meaning is interwoven in the Bhagavad Gita with the idea of love. If life or action is the finite and consciousness or knowledge is the Infinite, love is the means of turning life into Light, the bond of union between the finite and the Infinite. In all true love there is the love of the Infinite in the person or thing we love. 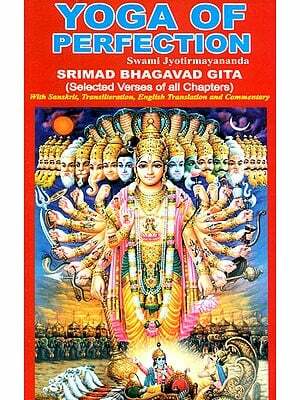 The Bhagavad Gita was included in the Mahabharata. This vast epic of over one hundred thousand slokas, or couplets, is the longest poem in the world: about thirty times as long as Paradise Lost, and about 140 times as long as the Bhagavad Gita ! About four-fifths of the poem are stories, and these are centred around the main story which is the story of a war. The word Mahabharata, meaning the great Bharata, reminds us of Bharata, the son of Sakuntala, the founder of a dynasty of Indian kings. The story is told in the Mahabharata, and was used by Kalidasa in his great drama Sakuntala, the masterpiece of Indian poetry. The main story of the Mahabharata centres around forces of good and evil represented, on the whole, as the Pandavas and the Kuravas. The father of Dhrita-rashtra and Pandu was the king of Hastinapura about fifty miles north-east of modern Delhi. At his death Pandu succeeded to the throne, as his eldest brother, Dhrita-rashtra, was blind. 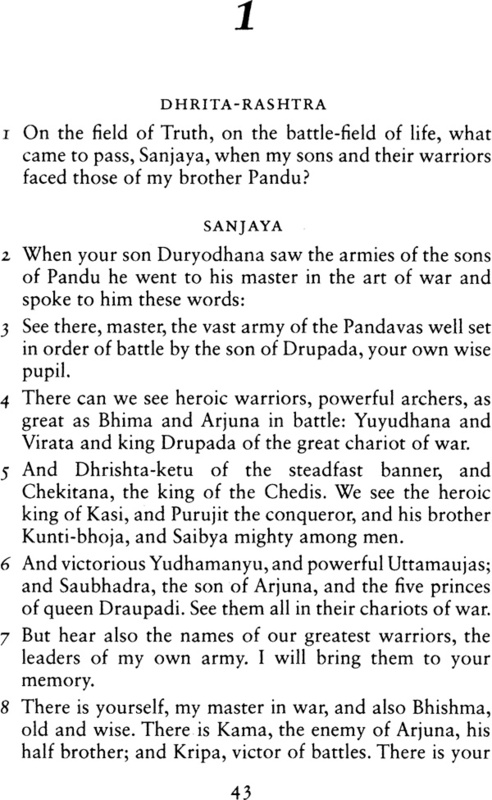 The sons of Pandu were Yudhishthira, Bhima, Arjuna, Nakula, and Saha-deva. We find their names in the first chapter of the Bhagavad Gita. Dhrita-rashtra had one hundred sons and the eldest was Duryodhana, the incarnation of evil. Pandu died and the blind king Dhrita-rashtra brought up in his palace the five sons of his brother. The Pandavas became great warriors and Dhrita-rashtra appointed the eldest, Yudhishthira, as heir-apparent. This was the cause of the great rivalry and in the end of the great war. The Mahabharata has eighteen books and the great battle where Duryodhana and all his armies were destroyed lasted eighteen days. The Bhagavad Gita has eighteen chapters. 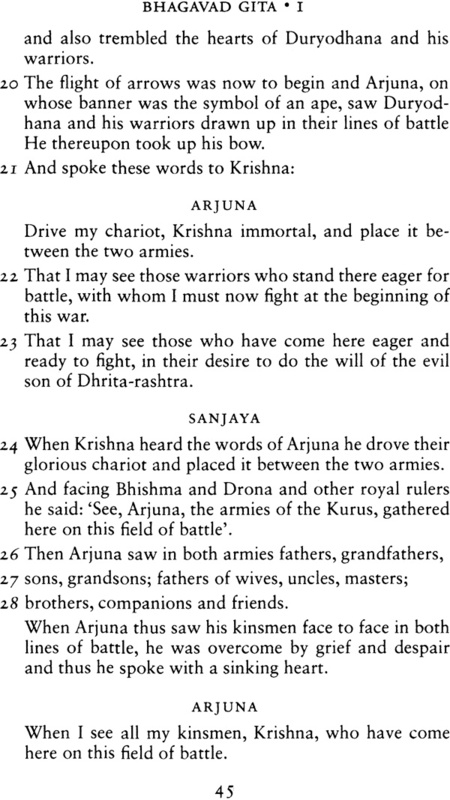 There is no doubt that the war described in the Mahabharata is not symbolic and that it may even be based on historical fact; but the problem is different when we find the dialogue between Krishna and Arjuna set in a background of war. The Mahabharata is the growth of centuries and to include a story in the Mahabharata was a way of securing its immortality. We find in the vast poem the story later on developed in the Ramayana, the stories of Nala and Damayanti, Savitri, Sakuntala and king Dushyanta, and many others. The Bhagavad Gita is like a little shrine in a vast temple, a temple that is both a theatre and a fair of this world; and whilst the war in the Mahabharata may be meant as a real war it is obvious that the war in the Bhagavad Gita has a symbolic meaning. The Arjuna and Krishna that we find in the rest of the Mahabharata are different beings from the Krishna and Arjuna of the Bhagavad Gita. We find in the Gita that there is going to be a great battle for the rule of a Kingdom; and how can we doubt that this is the Kingdom of Heaven, the kingdom of the soul ? Are we going to allow the forces of light in us or the forces of darkness to win? And yet, how easy not to fight, and to find reasons to withdraw from the battle ! In the Bhagavad Gita Arjuna becomes the soul of man and Krishna the charioteer of the soul. When we think of the chariot of Arjuna we can remember the image of a chariot in the Upanishads, in Plato, in Buddha, in Blake, in Keats. Of these the most interesting for spiritual purposes is the chariot in Buddhism which is called 'He that runs in silence'; the wheels of the chariot are 'Right effort'; the driver is dhamma, or truth. The chariot leads to Nirvana, the Kingdom of Heaven. The end of the journey is 'The land which is free from fear'. The Spirit in thee is a river. Its sacred bathing place is contemplation; its waters are truth; its banks are holiness; its waves are love. Go to that river for purification: thy soul cannot be made pure by mere water. Here we have the spiritual interpretation of the material bathing in the Ganges. We can also remember how parables have always been used for spiritual symbols. When Jesus spoke his parables he never meant them as 'true stories' but as stories of Truth, symbols leading to Truth. If we want to understand the spiritual meaning of the Bhagavad Gita, we had better forget everything concerning the great battle of the Mahabharata or the story of Krishna and Arjuna in the vast epic. A spiritual reader of the Gita will find in it the great spiritual struggle of a human soul. The war imagery is even used by Krishna in the poem when at the end of Chapter 3 he says: 'Be a warrior and kill desire, the powerful enemy of the soul'; and again at the end of Chapter 4 : 'Kill therefore with the sword of wisdom the doubt born of ignorance that lies in thy heart.' How could the treachery, robbery, and butchery of war be reconciled with the spiritual vision and love of the Bhagavad Gita ? How could we reconcile it with the Spirit of the Gita, and of all true spiritual seers, as expressed in those words of Krishna ? 'When a man sees that the God in himself is the same God in all that is, he hurts not himself by hurting others: then he goes to the highest Path.' 13.28. Scholars differ as to the date of the Bhagavad Gita; but as the roots of this great poem are in Eternity the date of its revelation in time is of little spiritual importance. As there are no references to Buddhism in the Gita and there are a few archaic words and expressions, some of the greatest scholars have considered it pre-Buddhistic, i.e. about 500 b.c . The Sanskrit of the Bhagavad Gita is, on the whole, simple and clear, like the oldest parts of the Mahabharata. This could be added as an argument for an early date; but the value of a spiritual scripture is its value to us here and now, and the real problem is how to translate its light into life. The Bhagavad Gita is, above all, a spiritual poem and as such it must be judged; and it must be seen as a whole. An analytical approach will never reveal to us the full meaning of a poem. If a Beethoven could give us in music the spirit of the Bhagavad Gita, what a wonderful symphony we should hear! First of all come the stirring sounds of an impending battle, the great battle for an inner victory, and the despairing cry of the soul ready to give up the struggle. The soul is afraid of death: of the death of its passions and desires. It also fears the death of the body: is death the end of all ? Then we hear the voice of the Eternal in man speaking to the soul that doubts and trembles: we hear about our immortality. After this come sounds infinitely serene and peaceful: the soul has peace from passions, and peace from fears and lower desires. The music becomes more urgent: it is the call to action, not action in time but action in Eternity: Karma Yoga. Those strains are followed by notes of eternal silence: it is vision, Jñana Yoga. Sweet human melodies are heard: it is the descent of Eternity into time, the incarnation of the divine. There is again a call to action, but this time the work is prayer, the deep prayer of silence which we find in Chapter 6. The music becomes more and more majestic : it is the revelation of God in all things in creation, but more evident in whatever is beautiful and good, in whatever has glory and power. Rising above the vast harmonies of this movement we hear a note of infinite tenderness. It is love. It is love that offers in adoration the whole of life to the God of Love, and God accepts the offering of a pure heart. The music rises again in tremendous crescendos that seem to overflow the limits of the universe: it is the vision of all things and of the whole universe in God. In this theme there is wonder and fear: the God of creation is also the God of destruction, the God of immortality is also the God of life and death. After those ineffably sublime harmonies the music descends to softer melodies: it is the vision of God as man, as the friend of the struggling soul. Whatever we do for a human being we do it for Him. For I was an hungered, and ye gave me meat: I was thirsty, and ye gave me drink: I was a stranger, and ye took me in: naked, and ye clothed me : I was sick, and ye visited me: I was in prison, and ye came unto me. The vast symphony of the Bhagavad Gita goes on. After the tenderness of love for Krishna, the God of Love, we have the universal harmonies of Brahman in the Universe. From the one in the many attained by love, we reach the splendour of all in the transcendent one. The music now changes : it is made of melodies of light and fire and darkness, the three Gunas, the three forces of the universe. New harmonies now are heard because we have the Tree of transmigration, the Tree of life, and the music carries us on from earth to heaven and from heaven to earth. We hear now terrible sounds: it is the noise of evil in creation; but this is drowned in the sounds of the good in all. The music returns now to earthly melodies, and after them we hear the glory of the sacred sounds om, tat, sat : the Infinite beyond the beginning, the middle and the end of all our work. At the end of this great symphony the different themes of the previous chapters are interwoven into one. The melodies of vision, love, and work in Eternity become one simple final strain of unearthly tenderness and beauty, the simple call of God to man: 'Come to me for thy salvation'. 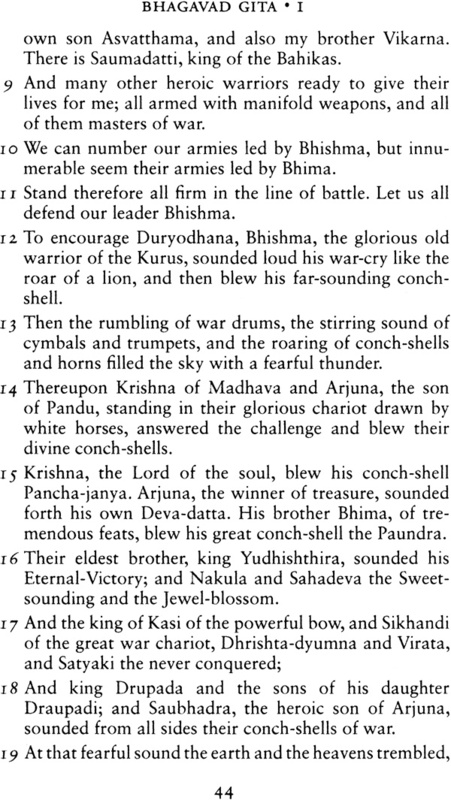 This is the symphony of the Bhagavad Gita. There are in it several themes which rise above the rest. There is Yoga. It is obvious that the spiritual Yoga of the Gita is love; but Yoga also means 'Samadhi', a state Of inner communion with the object of contemplation. When this contemplation is turned upon any being or object in creation, we have poetry: when it is turned towards the Source of all creation we have Light, spiritual vision. Inner Yoga is said to be above the Scriptures, because the Scriptures may be contradictory: above all past and future Scriptures the Gita places spiritual experience. When thy mind leaves behind its dark forest of delusion, thou shalt go beyond the scriptures of times past and still to come.When thy mind, that may be wavering in the contradictions of many scriptures, shall rest unshaken in divine contemplation, then the goal of Yoga is thine. What is the indispensable condition for this spiritual experience? It is very simple, and it can be very difficult: it is the absence of desires. That is to say: if we want things as objects of possession we are in the lower region of 'having', but if we find in things objects of contemplation and inner communion we are in the higher region of 'being'. All true love is love of Eternity, and the inner Light of Being is revealed only when the clouds of becoming disappear. This is the meaning of the verse of the Gita that says: 'Even as all waters flow into the ocean, but the ocean never overflows, even so the sage feels desires, but he is ever one in his infinite peace' 2. 70. Man can only find peace in the Infinite, not in the finite. This is expressed very clearly by St John of the Cross when he says: 'Cuando reparas en algo, dejas de arro-jarte al Todo', 'When you set your heart on anything, you cease to throw yourself into the All'. If we desire anything for its finite pleasure, we shall miss its infinite joy. The final words of Krishna to Arjuna are: 'Leave all things behind'. St John of the Cross tells us how we are able to leave all things behind and how not to look back: it is not to leave a vacuum in the soul, but to desire the Highest in all with the fire of burning love. Prayer is described in the Gita as a means to achieve inner union. It is interesting to compare Chapter 6 of the Gita with this passage from St Peter of Alcántara, the teacher of St Teresa: In meditation we consider carefully divine things, and we pass from one to another, so that the heart may feel love. It is as though we should strike a flint, and draw a spark of fire. But in contemplation the spark is struck: the love we were seeking is here. The soul enjoys silence and peace, not by many reasonings, but by simply contemplating the Truth. From the sense of harmony of the Gita comes its universal sympathy. This is suggested again and again through the whole poem, and it is definitely stated when Krishna says 'In any way that men love me, in that same way they find my love'. 4. 11 ; and 'Even those who in faith worship other gods, because of their love they worship me'. 9. 23. This spirit of tolerance is expressed by St Teresa in her homely way when she advises her nuns against too much zeal: 'Ni hay para qué querer luego que todos vayan por nvestro camino', 'There is no reason why we should want everyone else to follow our own path' Moradas 3.2.18. The importance given to reason in the Bhagavad Gita is very great. Arjuna is told that he must seek salvation in reason. 2. 49. And the first condition for a man to be worthy of God is that his reason should be pure - 18. 51 and 18. 57. Reason is the faculty given to man to distinguish true emotion from false emotionalism, faith from fanaticism, imagination from fancy, a true vision from a visionary illusion. Self-harmony, or self-control, is praised again and again in the Bhagavad Gita. All perfection in action is a form of self-control, and this sense of perfection is the essence of the Karma Yoga of the Gita. The artist must have self-control in the moment of creation, and all work well done requires self-control; but the Bhagavad Gita wants us to transform our whole life into an act of creation. Only self-control makes it possible for us to live in harmony with other people. Of course, as Kant clearly shows, self-control must be at the service of a good will; but a good will must have power, and all virtue depends on the power of self-control. The great psychological problem of self-control can be solved in different ways, and some are much easier than others. The spiritual answer is 'Seek ye first the kingdom of God.' If the joy of the inner kingdom is found, then the words of Spinoza, previously quoted, have found their spiritual setting. As soon the joy of the higher comes, the pleasure of the lower disappears. Many are the themes of the symphony of the Bhagavad Gita, but the central ones are three: jñana, bhakti, and karma : Light, Love, and Life. Jñana is the centre of the Upanishads, the means of reaching Brahman. The Gita also places the man of Jñana, the man of Light, above all men: he is in God. The three manifestations of Brahman revealed in Jñana are very present in the Gita: Sat, Cit, and Ananda, Being, Consciousness, and Joy. 2nd January, I880. Here there is a sense of rest and quietness. Silence in the house and outside. A tranquil fire gives a feeling of comfort. The portrait of my mother seems to smile upon me. This peaceful morning makes me happy. Whatever pleasure we may get from our emotions I do not think it can equal those moments of silent peace which are glimpses of the joys of Para-dise._Desire and fear, grief and anxiety are no more. We live a moment of life in the supreme region of our own being: pure consciousness. One feels an inner harmony free from the slightest agitation or tension. In those moments the state of the soul is solemn, perhaps akin to its condition beyond the grave. It is happiness as the Orientals understand it, the happiness of the hermit who is free from desire and struggle, and who simply adores in fullness of joy. We cannot find words to express this experience, because our languages can only describe particular and definite conditions of life: they have no words to express this silent contemplation, this heavenly quietness, this ocean of peace which both reflects the heavens above and is master of its own vast depth. Things return to their first principle, while memories become dreams of memories. The soul is then pure being and no longer feels its separation from the whole. It is conscious of the universal life, and at that moment is a centre of communion with God. It has nothing and it lacks nothing. Perhaps only the Yogis and the Sufis have known in its depth this condition of simple happiness which combines the joys of being and non-being, which is neither reflection nor will, and which is beyond the moral and the intellectual life: a return to oneness, to the fullness of things, the πληρωμα, the vision of Plotinus and Proclus, the glad expectation of Nirvana. This sense of Being is the sense of Brahman. From experiences similar to that described by Amiel, but of course infinitely greater, come the poems of St John of the Cross, the greatest spiritual poems of all time. In his aphorisms he says: "In order to be All, do not desire to be anything. In order to know All, do not desire to know anything. In order to find the joy of All, do not desire to enjoy anything'. 'To be', 'to know', and 'to find joy' correspond to the sat, cit, ananda, 'Being, Consciousness, and Joy' of the Upanishads. Whilst Jñana, the Light of God, is the highest theme in the Bhagavad Gita - 'The man of vision and I are one', 7. 18, says Krishna - we find that it is Bhakti, love, which is the bond of union between man and God and therefore between man and man. We can read in the Gita words that sound like the words of Jesus: 'For this is my word of promise, that he who loves me shall not perish' 9. 31. 'He who in oneness of love, loves me in whatever he sees, wherever this man may live, in truth this man lives in me' 6. 31. The Bhagavad Gita does not emphasize that God is reached by Jñana, because Jñana is God; but it says again and again that love is the means to reach God in whom Light and Love are one: 'By love he knows me in truth, who I am and what I am' 18. 55 and 'Only by love can men see me, and know me, and come unto me' 11. 54.
la cosa en pensar mucho, sino en amar mucho' although she adds that 'The love of God must not be built up in our imagination, but must be tried by works'. These ideas are in the spirit of the Bhagavad Gita. The vision of God is the grace of God; but the grace of God is the reward of the love of man. creation can be a mathematical equation for the mind and a song of love for the soul. Love leads to Light: Bhakti leads to Jñana, and Jñana is the joy of Brahman, the joy of the Infinite. Things of a day ! What are we, and what are We not ? A dream about a shadow is man: yet, when some god-given splendour falls, a glory of light comes over him and his life is sweet. It is not for the love of a husband that a husband is dear; but for the love of the Soul in the husband that a husband is dear. It is not for the love of a wife that a wife is dear; but for the love of the Soul in the wife that a wife is dear. It is not for the love of children that children are dear; but for the love of the Soul in children that children are dear. It is not for the love of all that all is dear; but for the love of the Soul in all that all is dear. The Bhagavad Gita is a book of Light and Love, but it is above all a book of Life: after Jñana and Bhakti, we have Karma. The word Karma is connected with the Sanskrit root Kri which we find in the English words 'create' and 'creation'. Karma is work, and work is life. The word Karma means also 'sacred work' and is connected with the sacrifice of the Vedas: the ritual of religion.' 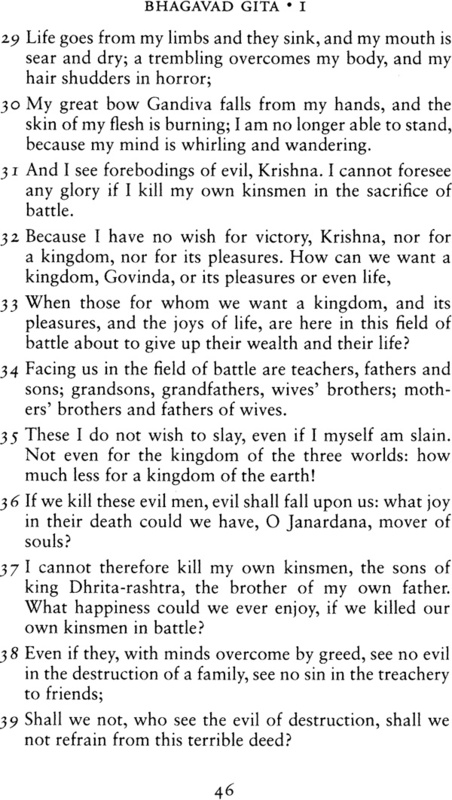 This meaning has to be considered in reading the Gita. Karma, work or action, is often contrasted in the Bhagavad Gita with Jñana, or contemplation: external ritual is set in contrast with inner spiritual life. This was the great spiritual change that took place in the Upanishads: from external ritual they went into inner life. This contrast is also found in the Gita, but in the Gita the word Karma has acquired a far deeper meaning, and this leads to one of the most sublime conceptions of man. All life is action, but every little finite action should be a surrender to the Infinite, even as breathing in seems to be the receiving of the gift of life, and the breathing out a surrender into the infinite Life. Every little work in life, however humble, can become an act of creation and therefore a means of salvation, because in all true creation we reconcile the finite with the Infinite, hence the joy of creation. When vision is pure and when creation is pure there is always joy. Here we find the joy of vision and creation. The poet sees every action, however humble, under the radiance of eternal beauty, and we see the actors finding a pure joy in their work, as if they were working for Eternity. The poet sees things in an Eternity of beauty and joy, and the actors are doing their work beautifully, in the joy of Eternity. This is the spirit of Karma in the Bhagavad Gita. Nausicaa and her maidens were washing laundry for themselves and not for God; but they were in the joy of action, and therefore in the joy of God, the more so because they were unconscious of this greatness. We find in Homer that work, even the most humble work, is beautiful. In the Bhagavad Gita we find that all work can be both beautiful and holy. We thus hear the words of Krishna: 'Offer to me all thy works and rest thy mind on the Supreme. Be free from vain hopes and selfish thoughts, and with inner peace fight thou thy fight' 3. 30. And with a variation of the same idea: 'Whatever you do, or eat, or give, or offer in adoration, let it be an offering to me; and whatever you suffer, suffer it for me.' This is the same voice of St Paul to the Corinthians: 'Whether therefore ye eat, or drink, or whatsoever ye do, do all to the glory of God' I Cor. 10:31. And this work must be unselfish: 'Let the wise man work unselfishly for the good of all the world' Gita 3.25. The praise of work as a means of salvation is later ex-pressed in the poem and we hear that all men attain perfection when they find joy in their work, and they find joy in their work when their work is worship of God, because God is joy. The greatness of the Bhagavad Gita is the greatness of the universe; but even as the wonder of the stars in heaven only reveals itself in the silence of the night, the wonder of this poem only reveals itself in the silence of the soul. We may begin when children to feel the mystery and wonder of this universe. One day, when very young, a few verses of the Gita may find their way into our hearts. We learn Sanskrit for the sake of the Bhagavad Gita. We read every translation we can find and compare different interpretations. We read the commentaries of Sankara and Ramanuja, histories of Indian philosophy and Sanskrit literature, and every publication on the Bhagavad Gita we can find. And far more than that: we may read the Bhagavad Gita in Sanskrit again and again, until we know the most important verses by heart, and chant them in Sanskrit, and the language of those verses becomes as familiar to us as our mother tongue. We may go to that poem in times of sorrow and joy and thus connect it with the deepest moments of our life; and write down the thoughts and emotions that the verses wake in us; and our reading may go on for years; and suddenly one day we may feel that we are reading the Bhagavad Gita for the first time. And why? Because new wonders have revealed themselves to us and we feel that the words of Arjuna are our own words: 'Speak to me again of thy power and thy glory, for I am never tired, never, of hearing thy words of life' 10.18. 'Within its deep infinity I saw ingathered, and bound by love in one volume, the scattered leaves of all the universe. If the light of a thousand suns suddenly arose in the sky, that splendour might be compared to the radiance of the Supreme Spirit. And Arjuna saw in that radiance the whole universe in its variety, standing in a vast unity in the body of the God of gods. Love leads to Light, but the Light is not ours: it is given to us, it is given to us as a reward for our love and our good work. In the battle of the Bhagavad Gita there is a great symbol of hope: that he who has a good will and strives is never lost, and that in the battle for eternal life there can never be a defeat unless we run away from the battle. The true progress of man on earth is the progress of an inner vision. We have a progress in science, but is it in harmony with a spiritual progress ? We want a scientific progress, but do we want a moral progress ? It is not enough to have more, or even to know more, but to live more, and if we want to live more we must love more. Love is 'the treasure hid in a field', and this field according to the Gita is our own soul. Here the treasure is found for which the wise merchant 'went and sold all he had'. And contrary to the law of matter where to give more means to have less, in the law of love the more one gives the more one has. The spiritual visions of man confirm and illumine each other. We have the cosmic greatness of Hinduism, the moral issues of Zoroaster, the joy in Truth of Buddha, the spiritual victory of Jainism, the simple love of Tao, the wisdom of Confucius, the poetry of Shinto, the One God of Israel, the redeeming radiance of Christianity, the glory of God of Islam, the harmony of the Sikhs. Great poems in different languages have different values but they all are poetry, and the spiritual visions of man come all from One Light. In them we have Lamps of Fire that burn to the glory of God. The finite in man longs for the Infinite. The love that moves the stars moves also the heart of man and a law of spiritual gravitation leads his soul to the Soul of die universe. Man sees the sun by the light of the sun, and he sees the Spirit by the light of his own inner spirit. The radiance of eternal beauty shines over this vast universe and in moments of contemplation we can see the Eternal in things that pass away. This is the message of the great spiritual seers; and all poetry and art and beauty is only an infinite variation of this message. If we read the scriptures and books of wisdom of the world, if we consider the many spiritual experiences recorded in the writings of the past, we find one spiritual faith, and this faith is based on a vision of Truth. Not indeed the truth of the laws of nature gradually discovered by the human mind; but the Truth of our Being. In the' Bhagavad Gita we have faith, a faith based on spiritual vision. In this vision we have Light. Shall we see ? This Song calls us to Love and Life. Shall we hear ? The aim of this translation is to give, without notes or commentary, the spiritual message of the Bhagavad Gita in pure English. In a few verses of the poem I have interwoven one or more words to make clear the meaning, or to explain a proper name, as when in 1. 8 Kama is described as 'the enemy of Arjuna, his half brother'. Considering that 'the letter kills, but the spirit gives life', I have avoided in a few cases the accepted translation of a word. The most conspicuous example is the very first word of the poem, 'Dharma', which I have in this particular case translated by 'Truth'. I came to this conclusion after years of thought; and I was very pleased when I read afterwards that Rabindranath Tagore in his 'Sadhana', Chapter 4, says that 'Dharma' is 'the truth in us'. The words of a poem have many waves of suggestion: I take the word 'Dharma' in this case to mean the Truth of the universe. As the Gita emphasizes God on earth more than the Brahman or Atman of the Upanishads, I have sometimes translated the word Brahman or Atman by 'God'. Like a sparrow that is alone upon the housetop. By adding 'become' and 'that is' the music is broken, and the meaning is weakened because the music is broken: 'He that hath ears to hear, let him hear'. I am responsible for the renderings in the Introduction, except for those which are signed. 'He who offers to me with devotion only a leaf, or a flower, or a fruit, or even a little water, this I accept from the yearning soul, because with a pure heart it was offered with love'.